I said today that I wanted to wear this dress all week, just to see if anyone noticed. I was half joking, and half wondering if I could get away with it since it is THE most comfortable dress I own right now. 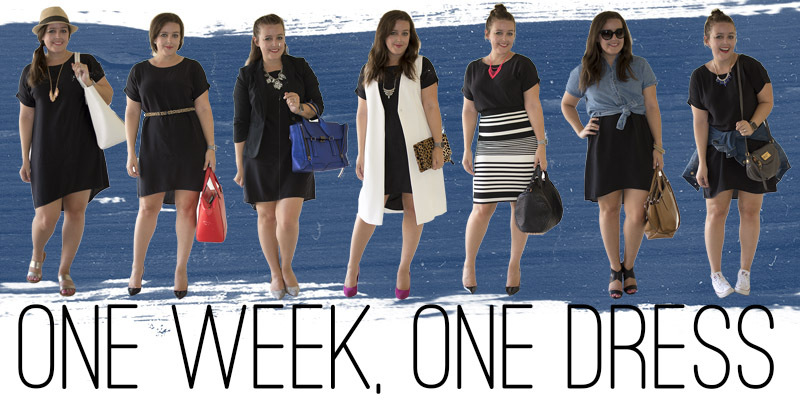 Thus, "One Week, One Dress" was born, just to see if I could. Dress, Everlane. Sandals, XXI (similar). Bag, JustFab. Hat, Goorin Bros (similar). Belt, Gap. Heels, Manolo Blahnik. Bag, Kate Spade. Blazer, The Limited (similar). Bag, 3.1 Phillip Lim. Flats, JustFab. Vest, XXI. Heels, JustFab. Clutch, Clare V.
Dress as top, Everlane. Skirt, Trina Turk. Heels, Manolo Blahnik. Bag, Alexander Wang. Shirt, Zara (similar). Wedges, JustFab. Bag, Coach (similar). Jacket, H&M (similar). Sneakers, Converse. Bag, Marc by Marc Jacobs.